This is a particularly important campaign as the American Football community has seen an array of our members, both in the UK and globally, struggle with these issues, in some cases with devastating consequences. 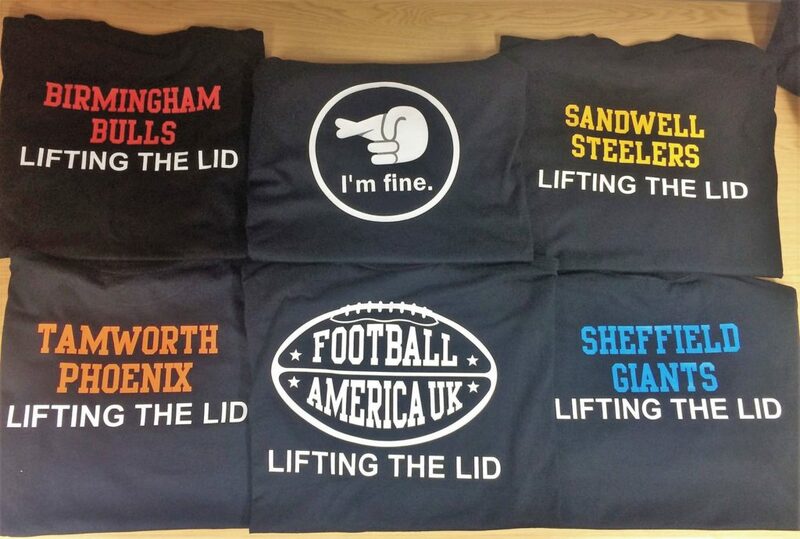 The aim of Lifting the Lid is to encourage the American Football Community to help change the stigma that continues to surround mental health. With the Britball community supporting this cause we can show our solidarity with those suffering with mental health issues and encourage them to “Lift The Lid” so they can talk about their issues freely and confidently, and ask friends, family and team mates for help. By talking about mental illness within our sports teams, social groups, and families we breed a society where people no longer feel isolated. We create a basis for change. We create a foundation for recovery. The reaction to the campaign so far has been overwhelmingly positive. Wayne Drew and Elliot Walters kicked the campaign off with ‘The Well Overdue Trim’. Cutting a combined 32″ of hair they were able to produce two wigs for young girls with cancer through the Little Princess Trust and raised £3620.06 for the mental health charity Mind. A huge part of the organisation is increasing awareness and encouraging sufferers to talk about their issues. The “I’m Fine” campaign does exactly that. Many teams within the UK have shown their support for this campaign by wearing our “I’m Fine” decal. 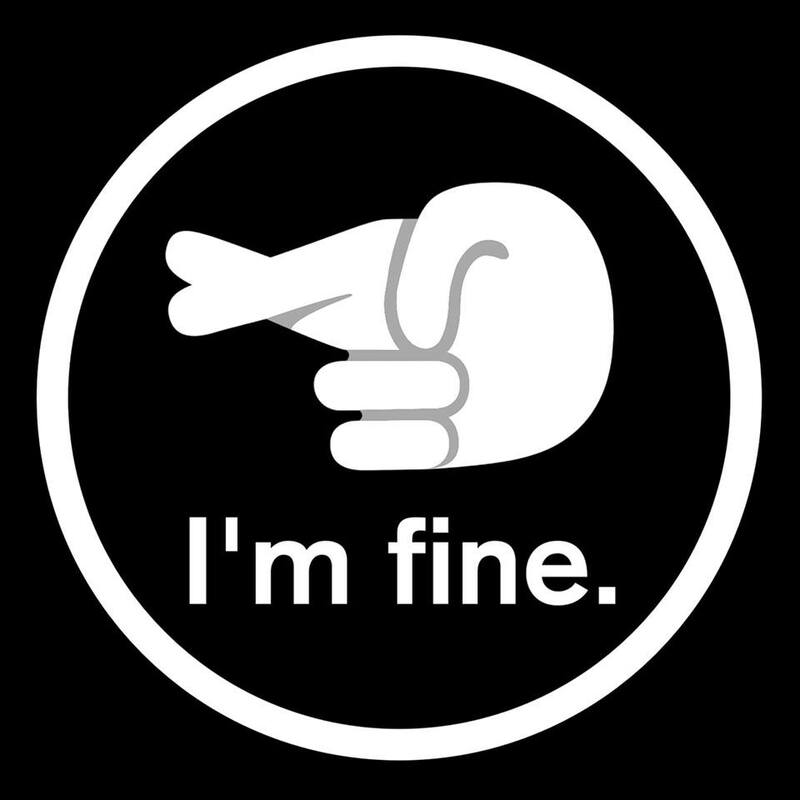 The decal embodies the struggles of many sufferers by presenting a fingers crossed motif and the statement “I’m Fine”. The symbol of crossed fingers has long been recognised as both a sign of hope and also as a permit to make false statements; symbolising the reluctance of many sufferers to voice that they are indeed suffering with some sort of mental health issue beneath the surface. Wearing the decal symbolises that the wearer offers themselves as an emotional outlet for sufferers, in an attempt to encourage sufferers to talk about their mental health issues. The “I’m Fine” Campaign has raised approximately £2500 from the I’m fine Decal sales and has currently 1178 Ballers representing the movement by wearing the decals. For anyone interested in supporting the campaign, the I’m fine Decals and T-shirts are on sale on the Football America website via the link below. 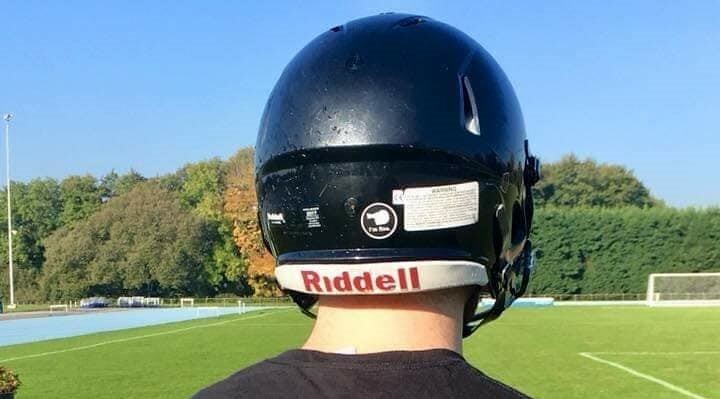 Last September, Ed Hopkins, the former QB of the Reading Rebels, GB under 19s, and the Reading Knights, raised £2500 for mind in memory of his former team mate, Chris Seal. Unfortunately Chris, former member of the Reading Rebels, Bath Spa Bulldogs, Coventry Jets and the Farnham Knights, suffered with depression and tragically took his own life 30/11/2018 and ultimately inspired the foundation of Lifting the Lid. Ed adds “As an illness, Depression is often insidious, invisible to others, and seemingly unbearable. I’m ashamed to say that throughout most of my life, I’ve been blind to the effects it can have on people (including myself), until recently”. 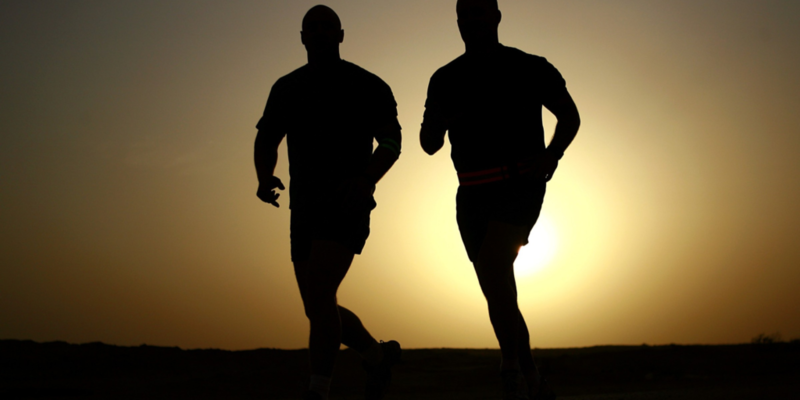 Ed will be running The Vitality Big Half on March 10th in support of the Samaritans. Any donations, big and small, can be made at this link. Developed by Andrew Marks of the Belfast Trojans, I Have a Story has been designed to give people a safe and welcoming platform to share their story with others to show just how common these issues are. Mental Millennial is a place where Andrew, as a millennial, shares his views and personal stories about all things mental health- from things he has gone through personally, to things he has learnt from others on his journey. In April 2017 Andrew lost a friend to suicide which acted as a catalyst in his life to really evaluate his own experiences of mental health.Throughout this past year from speaking to others he has acquired stories and anecdotes and learnt a range of thing things from many people inspiring him to share these publicly and encourage others to do the same. Thus, suffering individuals are encouraged to share their stories either openly or anonymously as a means of therapeutic release, as writing has been known to help reduce anxiety, ease feelings of emotional trauma, rationalise paranoid thoughts, as well as having a whole range of other mental benefits. 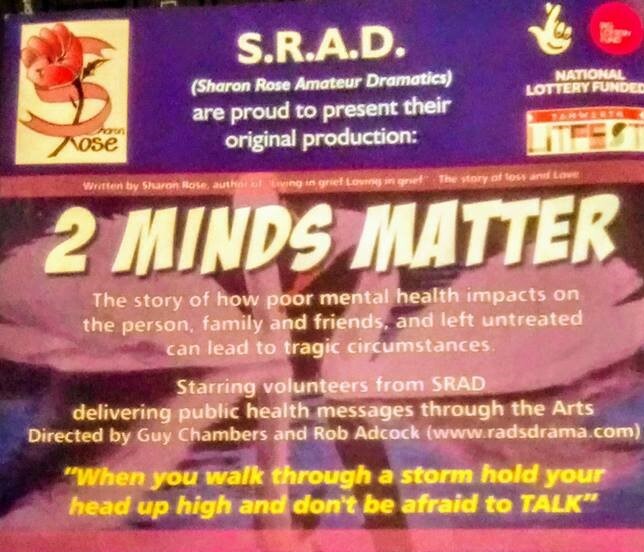 In addition to the Tamworth Phoenix donating all profits from all home home games from the 2017/18 season, their very own Jack Dearn is set to hit the stage in Sharon Rose’s production of 2 Minds Matter on the 16th of March at Wilnecote School, Tamworth. The play, an emotional rollercoaster with a powerful message, aims to raise awareness of the impact that mental health issues have on individuals and their families in the hope encouraging those with mental distress to seek help from friends and family in order to prevent potentially tragic circumstances. Within University football we’ve recently seen the Bath Spa Bulldogs worked with their University’s Student Union to host the first Mental Health Awareness 5-a-side football tournament. This was a huge event which increased the awareness of Men’s mental Health throughout the university and raised £545 for the Movember Foundation. Raising their own understanding of mental health issues and suicide awareness, The Warwick Wolves attended the first Suicide Awareness seminar hosted by Papyrus – Prevention of Young Suicide at The University of Warwick. Since, they have planned to host a 24 hour charity event to raise cash to support mental health charities the weekend before the Superbowl. This event will see the Wolves keep the ball in the air continuously during a “24 hour throw-around” in an attempt to break the NFL passing yards record and raise cash in aid for Young Minds and Mind. With the funds raised from this draw “Lifting the Lid” would look to continue it’s mental health awareness efforts by working with Papyrus to host the first 2 Day Suicide Intervention Skills Training Course for American Football Coaches and Welfare Officers. Equipping our coaches and welfare officers with these skills we hope to provide the community with the necessary skills to enable us to help our players to grow not only as players but also as people. More often than not we’re ignorant to the emotions and feelings of our peers and also of the potential impact we can have on their lives. Football’s big, but some things in life are bigger than Football.